Mr. Rashid Chaudhry has 15 years of experience working on development programs in Pakistan, including 10 years working on USAID and other international donor-funded activities in a leadership capacity. He holds a Master’s Degree in Mass Communication, and is currently serving as Deputy Chief of Party for USAID Ambassador’s Fund Grant Program being implemented by TDEA. Mr. Chaudhry has knowledge of all aspects of project management including staff development, planning, monitoring and evaluation, administration, grants management, reporting, and communications. 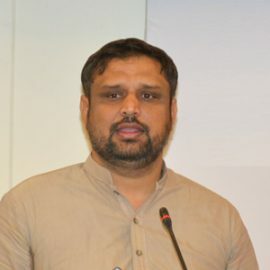 He managed two DFID-funded projects for TDEA valued at £3.0 million beginning in 2015, for example, aimed at improving democracy and governance across 50 districts in Pakistan through a combination of grants, training, and technical assistance. As Director of Programs for The Asia Foundation in 2014, he managed TAF’s role on two major USAID activities, the Gender Equity Program (GEP), and CVP. Additionally, Mr. Chaudhry helped manage a US $24 million DFID project entitled Supporting Transparency Accountability and Elections Program (STAEP) for TAF. STAEP was implemented across 98 districts in Pakistan with 33 major sub-grants, and had an impressive A+ final evaluation rating.